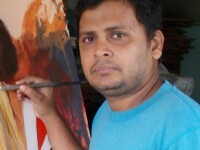 Satyabrata Karmakar is an Indian artist. Our country is rich in different cultures and traditions, there are various types of tribes living in India, such as Naga, Mijo, Khashi, Bodo,etc. They have different artistic ways. As an Indian artist he has great respect for them. His paintings are imaginary but inspired and influenced by traditional tribal folk art and Indian culture. Paintings shall be properly packed, and shipped in rolled format, using reputed courier services. Please do not accept the shipment in case it appears damaged or tampered with on arrival. Paintings once sold will not be taken back. However, in case of any concerns, you should reach out to me within 36 hours of receiving the artwork and I shall look into the matter.